Mark Schone and Matthew Cole, “American Jihadi Samir Khan Killed With Awlaki,” ABC News, September 30, 2011, http://abcnews.go.com/Blotter/american-jihadi-samir-khan-killed-awlaki/story?id=14640013. 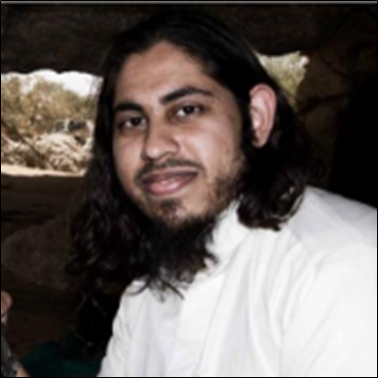 Oren Adaki, “AQAP publishes biography of American jihadist Samir Khan,” Long War Journal, November 2014, http://www.longwarjournal.org/archives/2014/11/aqap_releases_biogra_1.php. Robbie Brown and Kim Severson, “2nd American in Strike Waged Qaeda Media War,” New York Times, September 30, 2011, http://www.nytimes.com/2011/10/01/world/middleeast/samir-khan-killed-by-drone-spun-out-of-the-american-middle-class.html?_r=0. His father made numerous failed attempts to dissuade Khan from the extremist content by introducing him to various imams and Islamic scholars in his community.Robbie Brown and Kim Severson, “2nd American in Strike Waged Qaeda Media War,” New York Times, September 30, 2011, http://www.nytimes.com/2011/10/01/world/middleeast/samir-khan-killed-by-drone-spun-out-of-the-american-middle-class.html?_r=0. Michael Moss and Souad Mekhennet, “An Internet Jihad Aims at U.S. Viewers,” New York Times, October 15, 2007, http://www.nytimes.com/2007/10/15/us/15net.html?_r=0. Khan spent several years disseminating extremist content online while living in his father’s house.Mark Schone and Matthew Cole, “American Jihadi Samir Khan Killed With Awlaki,” ABC News, September 30, 2011, http://abcnews.go.com/Blotter/american-jihadi-samir-khan-killed-awlaki/story?id=14640013. “Leader of Revolution Muslim Pleads Guilty to Using Internet to Solicit Murder and Encourage Violent Extremism,” FBI, February 9, 2012, https://archives.fbi.gov/archives/washingtondc/press-releases/2012/leader-of-revolution-muslim-pleads-guilty-to-using-internet-to-solicit-murder-and-encourage-violent-extremism. Khan released the first issue of Inspire magazine in the summer of 2010. Inspire, which he reportedly called “America’s worst nightmare,” was a revitalized version of Jihad Recollections, according to AQAP’s biography of Khan.Oren Adaki, “AQAP publishes biography of American jihadist Samir Khan,” Long War Journal, November 2014, http://www.longwarjournal.org/archives/2014/11/aqap_releases_biogra_1.php. Starting in 2010, Khan reportedly worked alongside Minh Quang Pham, a Vietnamese-born British convert to Islam who used his graphic design skills to help edit the magazine. Pham was later arrested in June 2012 in the United Kingdom after attempting to prepare a suicide attack on London Heathrow International Airport.“Minh Quang Pham,” Counter Extremism Project, accessed June, 10, 2016, http://www.counterextremism.com/extremists/minh-quang-pham. “California Man Charged with Conspiring to Provide Material Support to Terrorism and Being ‘Straw Purchaser’ of Assault Rifles Ultimately Used in San Bernardino, California, Attack,” U.S. Department of Justice, December 17, 2015, https://www.justice.gov/opa/pr/california-man-charged-conspiring-provide-material-support-terrorism-and-being-straw. According to Ben Venzke, CEO of the private intelligence firm IntelCenter, Inspire provides individuals in the West with “inspiration, ideological framework, targeting philosophy and practical mechanics of building a bomb or conducting a shooting.”Suzanne Kelly, “Samir Khan: Proud to be an American traitor,” CNN, September 30, 2011, http://www.cnn.com/2011/09/30/world/meast/analysis-yemen-samir-khan/. Khan was killed alongside Anwar al-Awlaki in a September 30, 2011, U.S. drone strike that specifically targeted al-Awlaki.Jere Van Dyk, “Who were the 4 U.S. citizens killed in drone strikes?,” CBS News, May 23, 2013, http://www.cbsnews.com/news/who-were-the-4-us-citizens-killed-in-drone-strikes/. AQAP continues to publish Inspire.“Issue 14 of AQAP’s “Inspire” Magazine Focuses on Assassinations, Provides targets and Methods,” SITE Intelligence, September 9, 2015, http://news.siteintelgroup.com/blog/index.php/categories/jihad/entry/397-issue-14-of-aqap%E2%80%99s-%E2%80%9Cinspire%E2%80%9D-magazine-focuses-on-assassinations,-provides-targets-and-methods. Saudi-born U.S. citizen Samir Khan was a propagandist for al-Qaeda in the Arabian Peninsula (AQAP) and the creator of the group’s English-language magazine Inspire.